From left to right: Shrimp, Egusi (or MBika) flour, Vegetable stock, Onion paste, Thai red chilies, Oil and African Smoked fish. African smoked fish, rehydrated, boneless and crumbled. That flour is later used as thickener in dishes like soups and stews. If in West Africa, Egusi is mostly used in stews and soups as protein supplement, in Central Africa, MBika is used to make popular steamed cakes. Basically, MBika flour is mixed with meat, fish, shrimp or chicken then wrapped in banana-leaf packets to be later steamed or cooked over an outdoor grill. In Congo-Brazzaville and in the Democratic Republic of Congo, these packets are called Liboké ya MBika. Liboké simply means papillote in Lingala. MBika cakes are very popular in Central Africa, yet fairly unknown outside of the continent. It’s important to know that the quality of the Egusi or MBika flour is the key to the success of this recipe. If the flour was ground with low quality squash seeds, your dish will have a rancid aftertaste. And this is the last thing you want. So make sure to select the best quality flour for better result. MBika mixture blended with a hand mixer. Starting wrapping our little packets. One of the many reasons why I love this recipe is mostly because it’s a polyvalent dish which can be served as appetizer, with toasted bread slices, or as a main dish, accompanied with Chikwangue (steamed cassava bread). 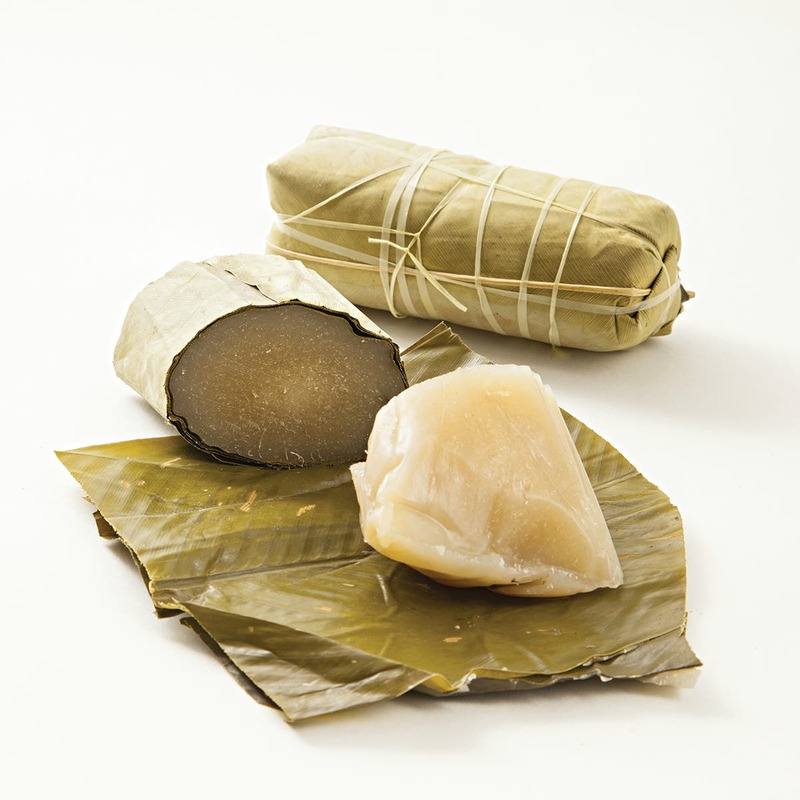 Time to unwrap our MBika cakes with shrimp and smoked fish. MBika cakes with shrimp and smoked fish. MBika cakes with shrimp and smoked fish ready to be sliced. And for those who are vegetarians or vegans, dried mushrooms can be used as substitute to smoked fish and any other type of vegan proteins can replace meat, fish or chicken. However, it would be fair for me to note that I haven’t tried to make a vegan version of this recipe at this moment. So it’s impossible for me to say if it works or not. But I’m planning to make a vegan version in a near future. Just make sure to remind me so I won’t forget. Liboké Ya MBika or MBika cakes with shrimp and smoked fish. Egusi or MBika flour can be found at various Exotic or Asian Markets. As I said before, the cakes are traditionally wrapped in banana leaves, however they can be replaced with parchment paper and aluminium foil. If you try this recipe at home, please let me know. 1 Cup of vegetable stock, low sodium. 1. Preheat the oven at 300°F. ** For Onion paste: In a food processor, chop one onion, three cloves of garlic, two green onions until obtaining a paste. 2. Since it’s important that the liquid used (whether it’s water or vegetable stock) is hot, heat your vegetable stock in the microwave for 1-2 minutes. 3. In a mixing bowl, with a hand mixer, blend squash flour with vegetable stock until the mixture turns smooth and homogenous. 4. Add to the squash flour mixture the onion paste, smoked fish, shrimp, red chilies, oil, salt and pepper. Incorporate everything together with a wooden spatula. 5. Line a piece of parchment paper on top of a sheet of aluminium foil. Pour approximately 4-5 tablespoons of the mixture on the parchment paper before wrapping it. Then wrap it with the aluminium foil in order to avoid any leak. Repeat the same exercise for the rest of the packets. 6. Place the packets on a baking sheet lined with parchment paper and cook them in the oven for 55-60 minutes at 300°F. Remove the cakes from the oven and let them cool on a cooling rack for 10 minutes before unwrapping them. Trim off the edges and slice each cake on a cutting board then transfer on a serving plate. Serve with spicy tomato chutney and toasted bread slices. If you didn’t buy already ground squash seeds, you can put the seeds in a mixer and grind them. The obtained texture should be similar to Almond meal. In this recipe, I used African smoked fish but you can always use chunks from whole roasted fish leftovers, just make sure to remove all the bones. Instead of baking the cakes in the oven, it’s possible to steam them for 50 minutes, over medium-low heat, with a bamboo steamer, and then finish the cooking in the oven at 300°F for 5 minutes. However when using the steamer, you need to reduce the amount of liquid (water or vegetable stock) to ¾ cup instead of 1 cup. This dish can be served as appetizer as well as main. Personally, I love to have MBika cakes as appetizer with crispy toasted bread slices.